This early morning view through the dome slit of the Anna B. Nickel 40" Reflector shows a conjunction of three planets framing the telescope top ring: Mars at lower left, Venus (brightest) above and right, and Jupiter above and left of Venus. Red observing lights tint the dome interior. 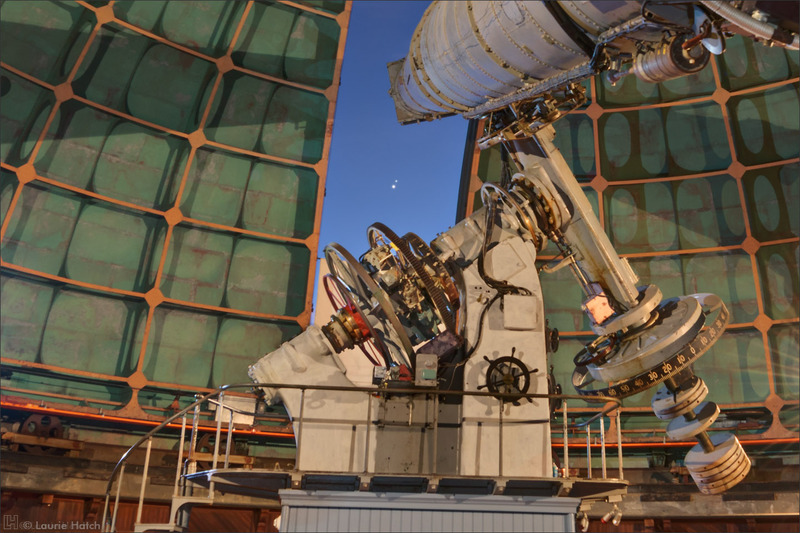 The Nickel is named for the San Francisco seamstress whose generous and unexpected bequest provided funding to design and build this telescope. Constructed in-house in the late 1970’s, the Nickel presently occupies the first dome to be completed on Mt. Hamilton, at the north end of the Main Building. The dome originally housed a 12" Alvan Clark Refractor which was placed in service in 1881. Careful dome modifications accommodate the Nickel’s larger field of view. At right in the foreground, the NIROSETI instrument (Near Infrared Optical Search for Extraterrestrial Intelligence) is attached to the bottom of the round black tub. 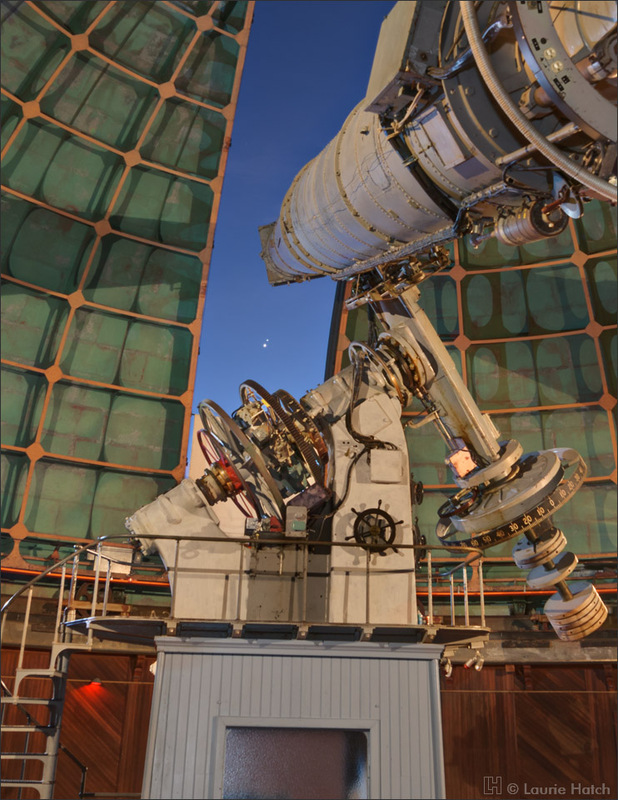 This innovative device is designed to detect as-yet-undiscovered nanosecond laser pulses from beyond our solar system. It is the only one of its kind in the world, and the first capable of detecting such brief bursts at near infrared wavelengths. What would Anna think if her telescope was the first to discover ET? Raw image file data were adjusted, optimized, and sharpened for digital output. This is a composited High Definition Range exposure stack of two consecutive frames (one lighter, one darker) shot with the same camera, lens, and tripod position. Because the center areas of imagery recorded with the 14-24mm lens typically tend to be unnaturally compressed and reduced in size, while perimeter areas are elongated and stretched, the central upper ring of the telescope and surrounding sky (including planets) and slit edges were moderately adjusted and expanded with the Photoshop Liquefy command to more correctly represent the overall relative shape of the telescope and slit structure. The planets were then readjusted for roundness. Their relative positions to each other and in the sky have been accurately maintained. A digital diffusion filter technique was applied to the planets to slightly expand and soften their glow, and to fine-tune color grading. All adjustments were made in order to overcome limitations in range of exposure and distorted optics, and to more accurately convey what I viewed in the moment of capture. (www.cloudynights.com/page/articles/cat/articles/astrophotography/diffusion-filter-overlay-with-photoshop-r126). Sincere gratitude is extended to the NIROSETI Team, and to University of California Observatories astronomers and staff for their generous and invaluable assistance in producing this photograph. 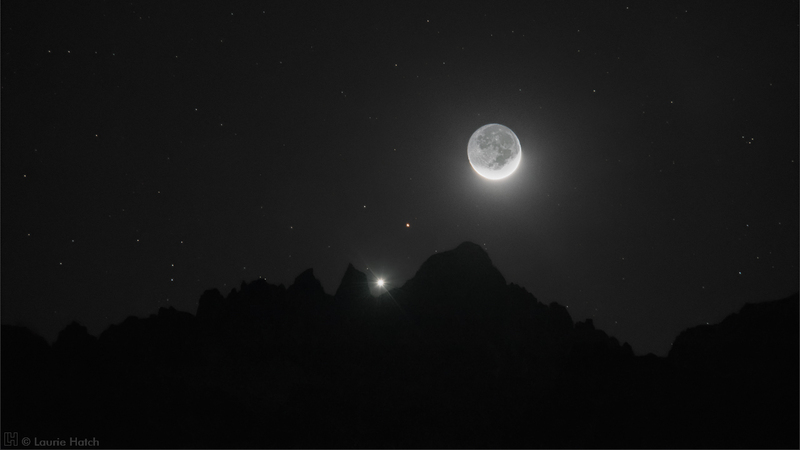 In this western view from Kepler Peak, a spectacular conjunction, or clustering of celestial objects, adorns the darkening sky over Silicon Valley. Our neighboring planet Venus is upper left; the first magnitude star Spica shines faintly below. A three-day-old waxing crescent moon (10% illumination) is flanked on the upper right by the planet Jupiter. The dark area of the moon is subtly illuminated by sunlight reflecting off the earth toward the moon; this effect is called “earthshine”. Spica is 260 light years from Earth, and is one of two stars that orbit closely around each other. This pair of stars appears as one to the naked eye. 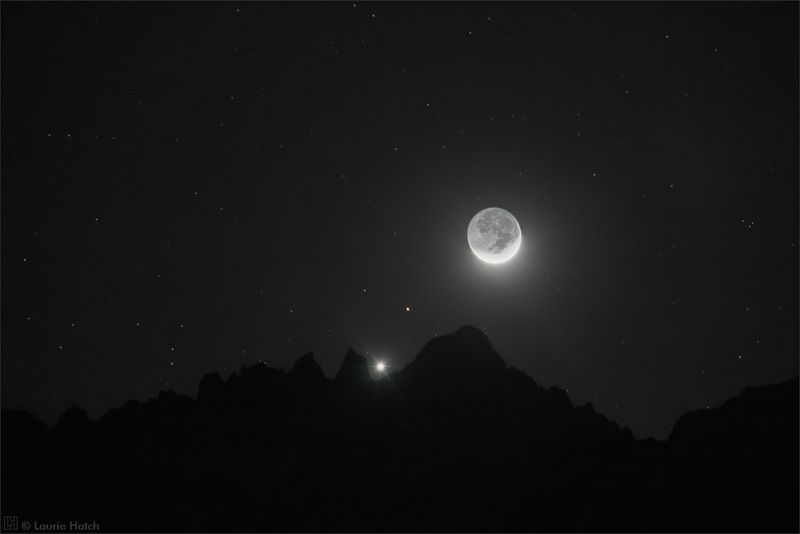 When visible, Venus is the brightest object in the twilight sky other than the moon. Similar conjunctions occur several times a year – the vigilant sky watcher will be rewarded with breathtaking celestial performances. The photographer thanks UCO / Lick Observatory staff and friends for their continual and enthusiastic support. 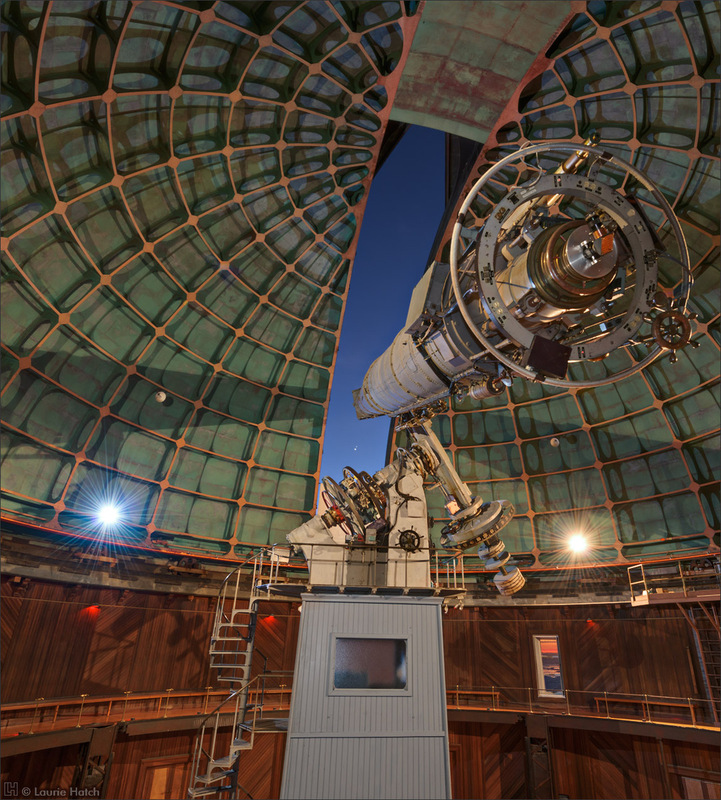 "Lick Observatory's Great 36-inch Refractor was the most powerful telescope in the world when it saw first light in 1888. The long 57-foot focal length (focal ratio f19.3) was intended to make it especially suitable for visual observations of planets, a primary occupation of astronomers of the period. In 1892, E.E. Barnard used this telescope to discover Amalthea, the fifth moon of Jupiter. This was the first such discovery since Galileo observed the first four moons nearly 300 years earlier, and was the last moon discovered with the otherwise unaided eye. This impressive instrument is now used for public viewing and educational programs. "In the gap below the telescope and adjacent the polar axle, note the conjunction of our two brightest planets: Venus, and Jupiter just above and to the left. Although of course still far apart in space, they appear apparently closer together along the line of sight in the sky than the diameter of the moon. Such events are not uncommon, although this occasion was particularly memorable in the early evening sky. With such bright objects in a bright sky, there would have been no reason not to have the dome lights on as shown here, even during actual observing. "With such a spectacular machine, it's fun to be able to enjoy it as well. Unfortunately, on this occasion we were unable to observe the conjunction with the telescope. 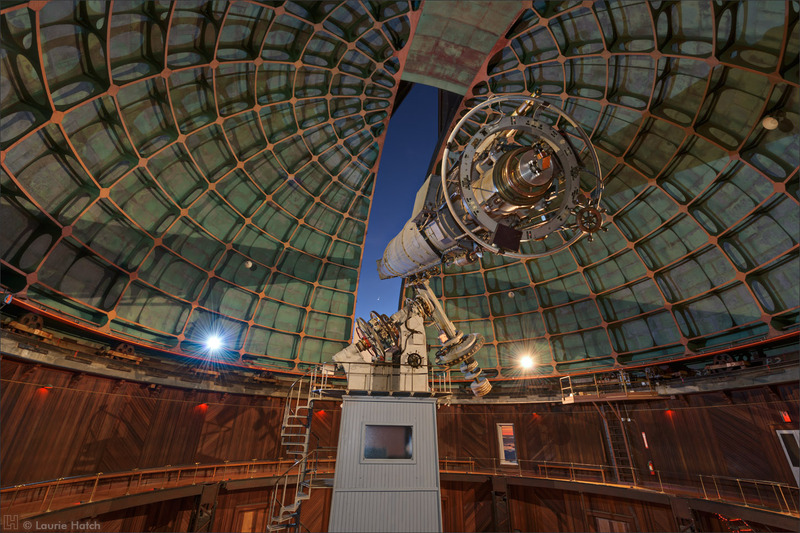 When the very long telescope is pointed low in the sky as it is in this photograph, access to the eyepiece would be gained by raising the movable dome floor 17 feet to the height of the railed ring seen circling the dome, and movable stairs would have been required to reach the eyepiece. At present, the floor awaits engineering evaluation of the aging mechanical components before it can be returned to normal use. This is a wonderful educational and public outreach tool, and we hope it will be returned to full functionality soon!" 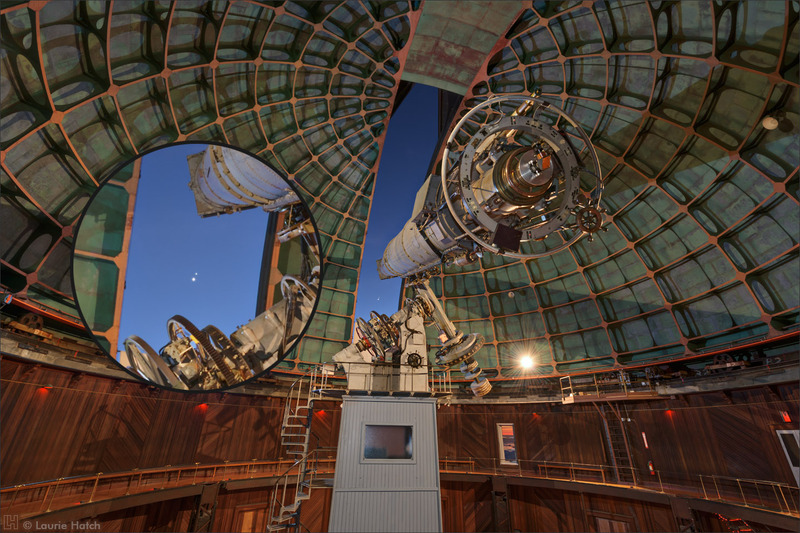 Sincere gratitude is extended to Lick Observatory astronomer colleagues, staff, and friends for their collaboration and invaluable assistance in producing this photograph. Special thanks go to Telescope Operators Patrick Maloney, Rodney Norden, and Keith Wandry. We had fun! 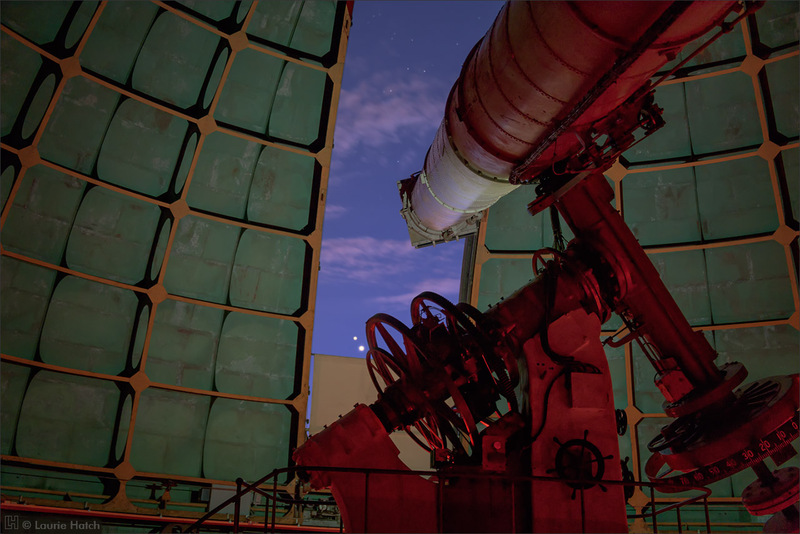 An unusual juxtaposition of green dome and red telescope occured when the telescope operator was standing out of view at the top of the pier opposite the camera, checking his cell phone. The neutral ambient phone light rendered the dome in a normal green color. Reddened areas on the telescope and pier not brightened by the phone reflect the characteristic color cast by red observing lamps in the dome. "Even the habitually frivolous become thoughtful when they enter the presence of the Great Telescope." Sincere gratitude is extended to Telescope Operators Patrick Maloney, Rodney Norden, and Keith Wandry, as well as University of California Observatories / Lick Observatory astronomer colleagues, staff, and friends for their generous and invaluable assistance in producing this photograph. "In the gap between the telescope and the polar axle, note the conjunction of our two brightest planets: Venus, and Jupiter just above and to the right. Although of course still far apart in space, they appear apparently closer together along the line of sight in the sky than the diameter of the moon. Such events are not uncommon, although this occasion was particularly memorable in the early evening sky. With such bright objects in a bright sky, there would have been no reason not to have the dome lights on as shown here, even during actual observing. Note the sunset peek-a-boo view over South San Francisco Bay through the dome window, lower mid right. 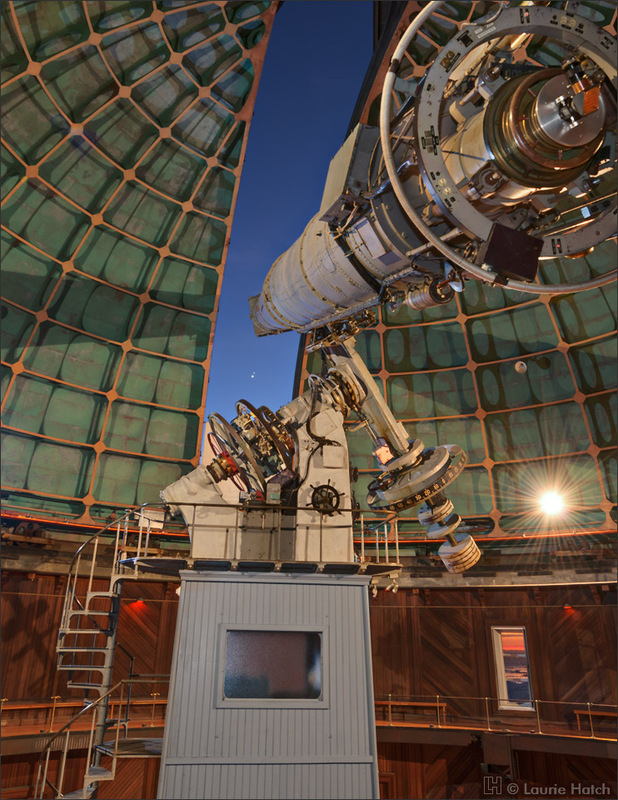 Sincere gratitude is extended to Lick Observatory astronomer colleagues, staff, and friends for their collaboration and invaluable assistance in producing this photograph. Special thanks go to Telescope Operators Patrick Maloney, Rodney Norden, and Keith Wandry. We had fun! In this western view from the Main Building roof, a spectacular conjunction, or clustering of celestial objects, brightens the darkening sky over Silicon Valley. Our neighboring planet Venus is centered between Jupiter on the right, and a four-day-old waxing crescent moon (16% illumination) on the left. The dark area of the moon is subtly illuminated by sunlight reflecting off the earth toward the moon; this effect is called “earthshine”. When visible, Venus is the brightest object in the twilight sky other than the moon. Similar conjunctions occur several times a year – the vigilant sky watcher will be rewarded with breathtaking celestial performances. Because the human eye is an extraordinarily capable detector, I could simultaneously see the extremely bright moon, planets, Main Building exterior, dome interior, sky, and landscape. However, the digital camera was unable to accurately detect this broad range of exposure values in a single frame. In order to compensate for this deficiency, several frames were shot only moments apart. One brief exposure was made of the exceedingly luminous celestial objects. Longer exposures recorded the Main Building exterior, dome interior, and landscape. All frames were digitally blended in Photoshop using High Dynamic Range Imaging. The finished image faithfully transmits what I witnessed, and overcomes limitations of camera capture. In wider angle views of this image, a sunset peek-a-boo view over South San Francisco Bay can be seen through the dome window, lower mid right. 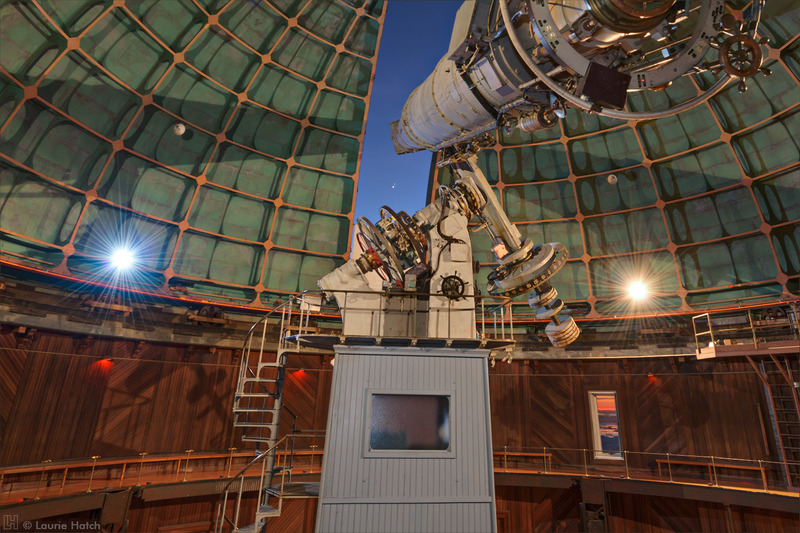 The window is not visible in this close up view.Sincere gratitude is extended to Lick Observatory astronomer colleagues, staff, and friends for their collaboration and invaluable assistance in producing this photograph. Special thanks go to Telescope Operators Patrick Maloney, Rodney Norden, and Keith Wandry. We had fun!